I have been sick for a few days this week so plans needed to be adjusted. Matey (8) also wasn’t the best so we have spent a few days resting. The kids, though, discovered snorkelling. We live only a few minutes drive from the beach so most days this week, we have been there with Matey and Princess (10) snorkelling. Hubby’s work was extremely quiet so he managed to take the kids whilst I was out of action. 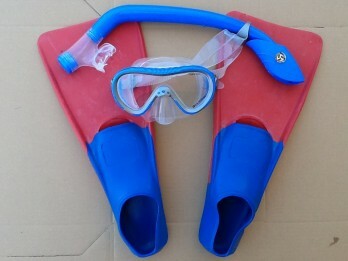 Snorkelling for Matey brings a new level of excitement and adventure. We have been reading the Lee Roddy series on Josh Ladd, a ten year old boy living in Hawaii who gets into a lot of dangerous adventures but always gets saved at the last minute. Josh Ladd goes snorkelling and Matey wanted to try. There are two bays either side of the car park at our local beach but there is a rocky jutting out in the middle. It is impossible to walk around the rocks as the yacht club have a building there as well as it being extremely steep. Matey managed to swim and snorkel around with hubby and this was an exciting adventure. I believe that boys need to be doing exciting and adventurous activities, within limits, otherwise when they are older, they look for it in the wrong places eg drugs, driving fast cars, alcohol etc. It has to be all age appropriate of course. It was also my birthday so I was spoilt by the kids taking charge with all the meals and making and decorating the cake completely themselves. That in itself was a huge treat for me. We caught up with close friends and had a great time instead of schoolwork so that was also a treat for the kids. The Five Love Languages: Over one of our evening meals we discussed “The Five Love Languages” by Gary Chapman. He identifies five different ways that we receive and express love to each other. They are physical touch, verbal expression (eg saying “I love you”), gifts, spending quality time together, and acts of service. He makes the point that every child needs to experience all five of the love languages. We were able to identify each other’s ways of receiving love (how we know that mum loves us etc) and how we usually express love in the way we receive it. A classic example in our family is Princess dislikes Matey touching her and hitting her and trying to cuddle her. Matey’s primary love language is physical touch, so when he tries to touch Princess, he is trying to express love to her. Princess, whose primary love languages are receiving gifts and spending quality time together, dislikes Matey trying to touch her and doesn’t get the point that he is trying to tell her he loves her. After identifying each other’s love languages, we were able to diffuse a situation quickly where things would normally have escalated to a shouting match with various family members expressing their anger in an unhealthy manner. Literal thinking: I love connecting with other families and gleaning parenting tips from them. This is one of my passions. During the week, we had an opportunity to connect with an amazing family. It was interesting to hear the mum share about one of the children and how that child is a literal person. Once they realised this, it changed everything immediately. Beforehand, they would ask the child why they had punched their sister, and that child would deny punching her. They would then start questioning whether this child also had a lying issue etc. Instead, the issue for the child was that they had “hit” their sister, not punched them. They also saw the literal translated into how that child prayed to God. They had had trouble with that child expressing their feelings and thoughts to God and conversing with Him. Once they realised that their child took things very literally, they explained that since God is omnipresent, He was in the room with the child and to just talk to Him like He was sitting in that chair. It transformed their child’s prayer life. This has helped me in parenting one of our children tremendously. 5 Second Rule: The New board game that was played this week was “The 5 Second Rule”. This is a game for kids aged 8+. You take it in turns to answer a question so as to move forward. 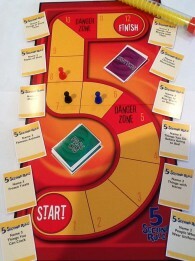 It is a very fast paced game as once the question is asked, you only have five seconds to answer. Questions come in 3’s eg ‘Name 3 things with horns’, ‘Name 3 food items you can put in a salad’, ‘Name 3 different hairstyles’, ‘Name 3 places where animals are found’, ‘Name 3 countries where the Euro is the currency’, ‘Name 3 things found in every town’ etc. It is great for teaching skills of thinking fast and for enlarging your knowledge of everyday things. It was over within 15 minutes. The kids loved it and wanted to keep playing, always a good sign. I have made part of their homeschooling work to play a board game on three different week days as I believe that so much is learnt – co-operation, playing fairly and honestly, general knowledge, fun, literacy, maths, geography, etc. I am passionate about playing games together as a family. Prophetic Words: This week we have begun asking God for pictures and words for friends of ours who are involved in starting a christian school in Nepal. These friends have spent a lot of time, money and effort in getting it all up and running. They have done a number of courses in helping it to be suitable for Nepal, not just transferring principles from our first world culture to a third world culture and education system. We are so excited as a family about the future of this school and the impact it will have on the children of Nepal and the country of Nepal. Thus, we want to sow financially and practically into the school. One of the ways we are supporting them is praying for them and getting prophetic pictures and words for them. It was so exciting to read Princess’s words that she wrote for them. I encourage you as a family, when you hear of opportunities like this, to sit down as a family and ask all family members how you can best support them.